Archintorno created a tactile wall filled with mystery objects for kids to explore and learn about the senses. The cultural cooperative Le Nuvole commissioned Archintorno to create a tactile wall for children that would engage their senses by touching and feeling many different materials. Taking inspiration from Robert Rauschenberg’s artworks made from found objects, our design, titled Il Rompascitole, utilized re-usable, low-cost materials that had minimal waste production and were easy to transport and assemble/disassemble. The wall structure was built by interlocking sheets of corrugated cardboard that formed a grid of shelves that could be reconfigured to suit the space requirements. 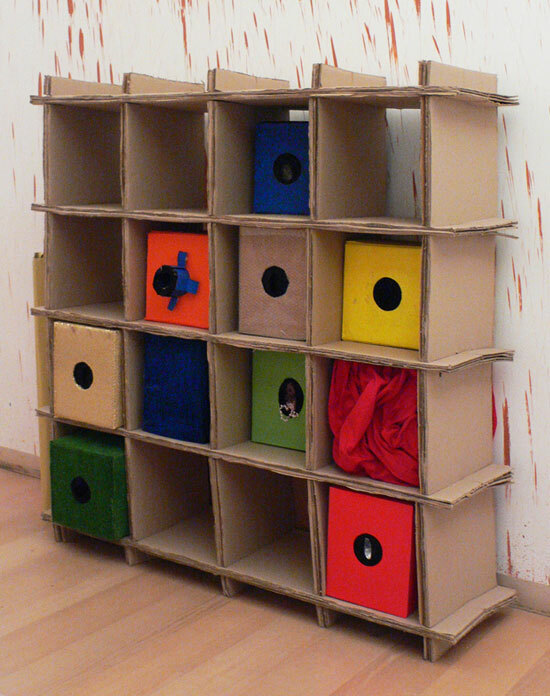 We made boxes with different surface materials and colours that nested in the shelves. 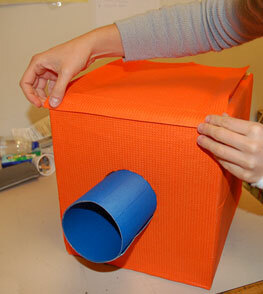 Mysterious objects were placed in the boxes, and kids could reach into the box through an opening and feel the objects and recognize them through touch.